The PS-415-HG Medical-Grade Power Strip supplies power outside of patient-care vicinities, such as administrative areas or in resident rooms of long-term care facilities that do not use line-operated electrical equipment for diagnostic, treatment or monitoring purposes. Compliant with UL 1363 specifications, this 120V, 50/60 Hz power strip features a NEMA 5-15P-HG hospital-grade plug and four NEMA 5-15R-HG hospital-grade outlets.Anti-Microbial Protected with EPA Registered and FDA Compliant Silver Iconic Technology known to inhibit growth of Microbes on surfaces.A built-in resettable 15A circuit breaker controls power to all outlets and protects the power strip against overloads. Switchless design prevents the unit from being accidentally shut off. The 15 ft. cord provides ample reach to a power source.Keyhole mounting tabs and flanges make installing this power strip easy. The all-metal housing ensures safety and is guaranteed to last a long time in demanding surroundings. 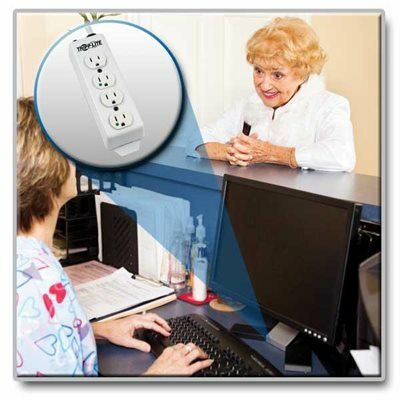 With Tripp Lite's PS-415-HG Hospital-Grade Power Strip, you'll have reliable outlets where you need them. The PS-415-HG provides four hospital-grade outlets in an all-metal housing that ensures safety and is guaranteed to last for life, making it ideal for operating rooms and administrative areas. It can be mounted in a variety of ways with its integrated keyhole mounting slots and with the length provided by the 15-ft. power cord, you don't have to install the PS-415-HG next to outlets you already have; it can be mounted across a large area and deliver reliable service where you need it most. The switchless design eliminates accidental shutoffs, while a 15-amp circuit breaker guards against dangerous circuit overloads before they happen. Additionally, the PS-415-HG comes with a lifetime product warranty for guaranteed peace of mind. With keyhole mounting installation, rugged housing and plenty of outlets, Tripp Lite's PS-415-HG is ideal for healthcare administrative environments. It provides reliable, consistent power service for multiple devices. The keyhole mounting slots allow the PS-415-HG to be installed wherever reliable, multi-outlet power distribution is required. Featuring four hospital-grade outlets, the PS-415-HG is an ideal solution for applications or locations that require power to many devices simultaneously. Install the PS-415-HG far away from its power source and provide power distribution to previously un-powered areas with the long, 15-ft. power cord. The PS-415-HG can be mounted in a different area, or a completely different room, from where it draws AC power, putting you in control of getting reliable power service where you need it most. The cord comes with a hospital-grade 5-15P-HG plug. The switchless design prevents accidental shutoff while a built-in, 15-amp circuit breaker eliminates dangerous circuit overloads that could damage equipment. The breaker immediately shuts off AC input to the PS-415-HG when it detects that the equipment load is drawing too much power. The PS-415-HG's rugged, all-metal housing is durably constructed making it a great solution for applications in demanding environments. Get peace of mind with Tripp Lite's lifetime product warranty, which protects your product against any technical defects or malfunctions for as long as you use it. The PS-415-HG also comes with a green, RoHS-compliant design.